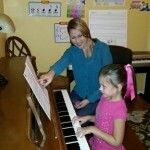 My name is Rachele Doray, instructor and owner of Bright Start Piano Studio. I am a graduate from Sam Houston State University with a Bachelors in Music Therapy. My love of teaching led me to open Piano and Play Music in Dayton, Ohio 5 years ago, a program which focused on fundamentals of music and piano for beginners in a group setting. Since moving back to Texas, I have opened a private piano studio teaching individual students to continue my passion of laying a music foundation for young beginners. I accept beginner and early intermediate students of any age (under 5 with a brief evaluation). I believe that young children have an innate desire and joy of learning. When that is paired with the right teacher, it creates an environment in which a child is excited to continue learning. It is a vital step in setting the tone for enjoyment and desire to further their music education as they get older. Why am I the right teacher for your child? I have a patient and encouraging personality which lends itself to working with children. My teaching style builds upon a student's strengths to create an environment of weekly success. Let others know about Bright Start Piano Studio. Did this teacher help you to learn? How long did you take lessons? Are you still playing music? Share any thoughts or stories you have so that others can know about this teacher!